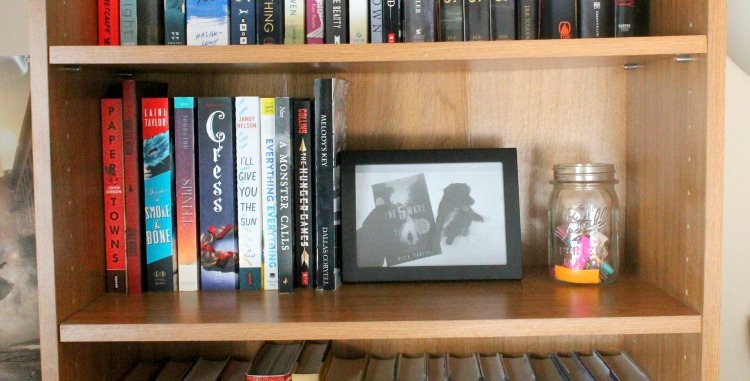 New year, new books .. which leads to cleaning out your bookshelf. 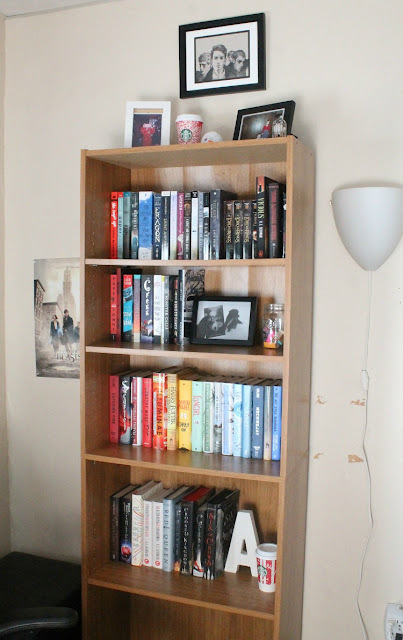 In December, I got a new bookshelf then came Christmas and a book signing. Before I knew it, my new bookshelf was overflowing (with books). So I did some cleaning and organizing and wallah! A bookshelf tour. Enjoy! I got my new bookshelf from my parents and I'm pretty they bought it from Walmart. The wood color is honey oak (again, I think) and I have no idea what size the bookshelf is. I hope this helped haha! 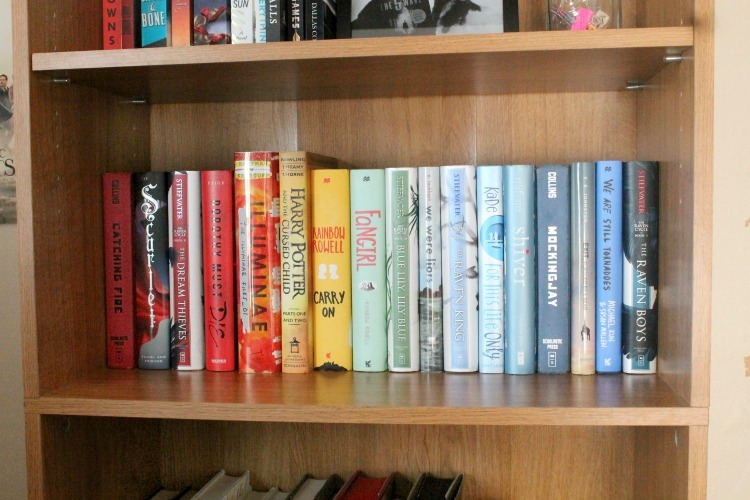 My whole bookshelf! It's quite nice yes? I love it and the books on it. 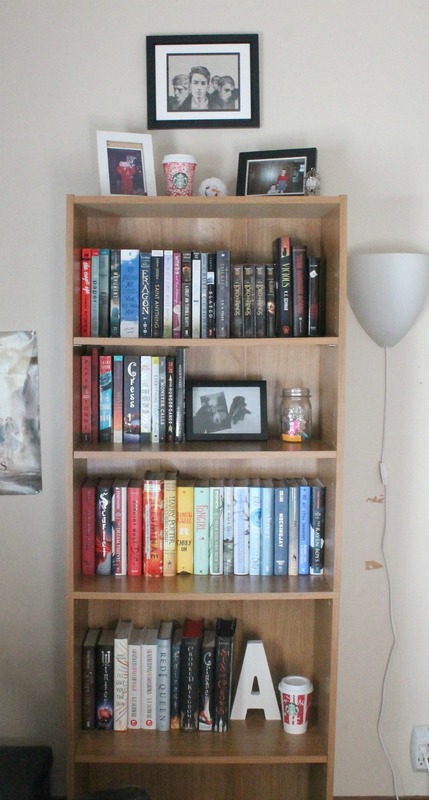 My main organizing system is by color but I also organize by my tbr, paperback and hardcover. I swear - it works bookworms. This is the top top TOP shelf on my bookshelf. No books but I put some pictures up of me, my sister and the Raven Boys. 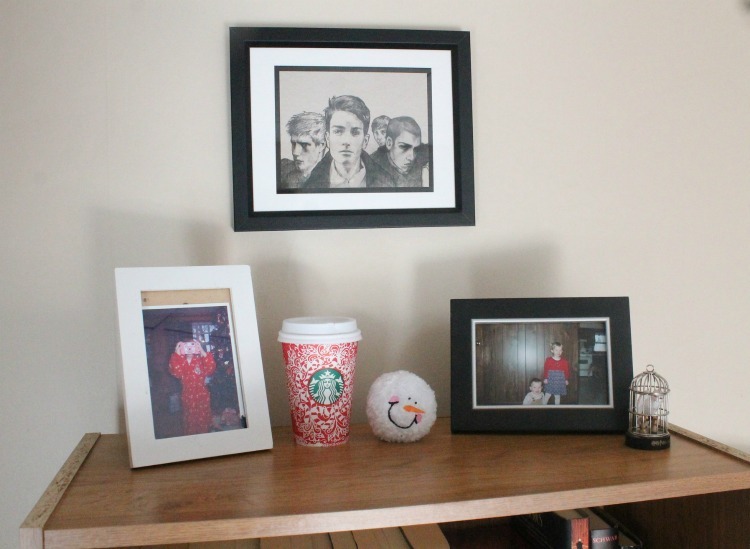 Also I have a Starbucks cup (#aesthetic), a stuffed snowball and Hedwig. Here's shelf two! This shelf contains my physical (key word here) tbr - paperback and hardcover. A lot of these books are old ARC's but I still can't wait to read them! Shelf number three holds my read paperback's and a framed photo of Dakota, our family dog who past away in late December. I also have a Mason jar filled with paper tabs. I like to add little notes in my books, although, recently I started writing my notes in the book. Wild, I know but I'm enjoying it! Shelf four is definitely the most colorful! This shelf contains (half of) my read hardcovers. If I had to pick a favorite shelf, it would be this one because it's so colorful and (almost) all my favorite books are here. And shelf #5 completes my read hardcover books. 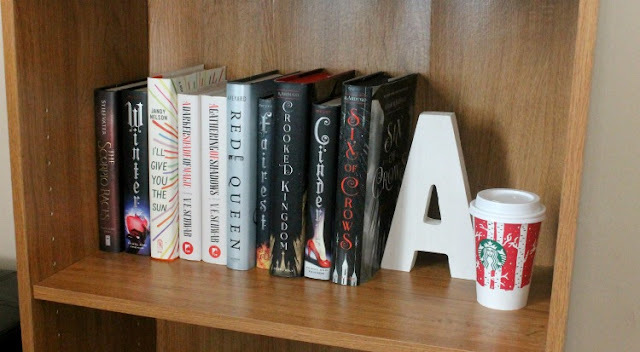 I added my big letter A (to hold up the books) and another Starbucks cup (me? collecting starbucks cups? no way). I do have one more shelf under shelf number five but I don't have anymore books (for now) to place. So I'm just storing my laptop stuff there. 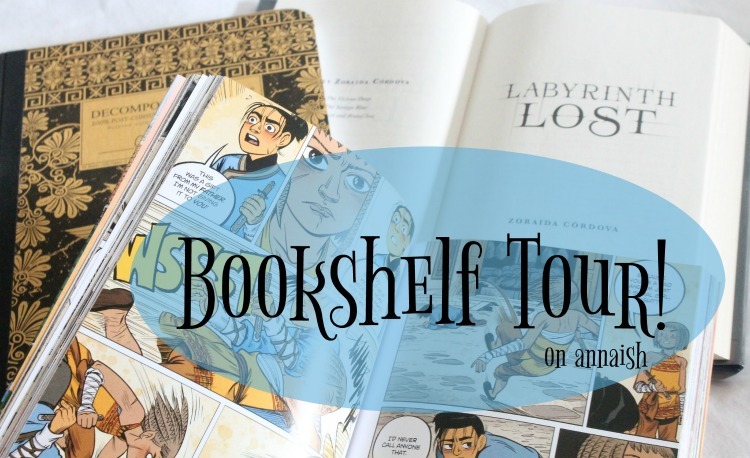 I hope you enjoyed that bookshelf tour everybody! Now, tell me, how do you organize your books? How many books do you own? 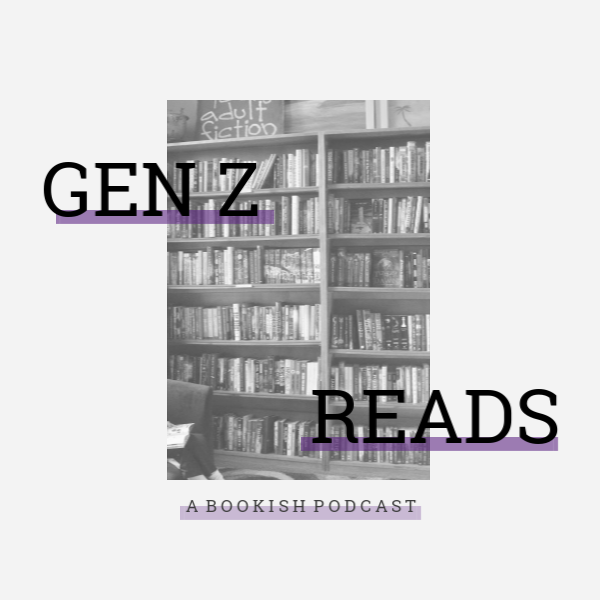 Paperback or hardcover? Let's chat about it! 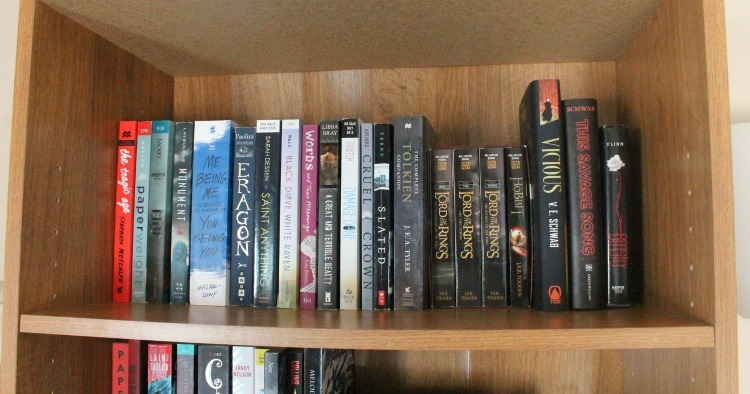 Beautiful bookshelf! That picture of the Raven boys is just gorgeous! I actually was just organizing my bookshelf by to be honest there's really nothing special about it. Although I did put a framed quote of my favourite book the outsiders on it, so that's something! Thank you! Ooo - I like that idea! THE LORD OF THE RINGS. THE HOBBIT. ERAGON. YOU MUST READ IMMEDIATELY. (Although be prepared for the first half of The Fellowship of the Ring to be incredibly boring. IT GETS BETTER, I PROMISE.) Vicious is also on my TBR! Rainbow books!!! 12/10 for aesthetic. My bookshelves are organized thusly: not at all. The only way in which they are even somewhat organized is that I have all my Tolkien stuff in a display on top of the shelves, and my second bookcase is 100% for Terry Pratchett because he wrote so freaking much and I have most of his things. New GFC follower <3 Uma@Books.Bags.Burgers. GAHH ME TOO!! HELLO FELLOW RAVEN CYCLE FAN ASDFGHJKL. Thank you! Gotta do it for the aesthetics ;) Me too! V.E Schwab is my (newest) favorite author so I must read all of her books. Again, thank you! !